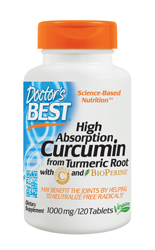 Best Curcumin C3 Complex® by Doctor's Best®, contains a potent standardized extract of Curcuma longa root, commonly known as turmeric. Turmeric is the yellow spice that gives flavor to curried dishes. The herb has been used in the Ayurvedic healing tradition for centuries as a folk remedy. The active ingredients in Curcuma longa are plant substances called curcuminoids, compounds that demonstrate potent antioxidant properties in scientific studies. Curcuminoids may benefit the joints, brain, heart and the circulatory system by helping to neutralize free-radicals. Best Curcumin C3 Complex® supplies 95% total curcuminoids, including curcumin, bisdemethoxy curcumin and demethoxy curcumin. Bioperine® is an extract of Black Pepper fruit that contains 95-98% piperine. Bioperine® is added as a natural bioenhancer to promote absorption. Ingredients: (per serving) Turmeric root (Curcuma longa) - 1000 mg, Curcumin C3 Complex® Standardized to >95% Curcuminoids - 950 mg, including Bisdemethoxy Curcumin (2.5 - 6.5%), Demethoxy Curcumin (15 - 25%), Curcumin (70 - 80%), Black pepper fruit extract (Piper nigrum) - 5 mg (BioPerine®). Other Ingredients: Microcrystalline cellulose, stearic acid, magnesium stearate (vegetable source), silicon dioxide, croscamellose sodium. Suggested Adult Use: Take 1 tablet two times per day with or without food.